How do we support low-income Latino families with appropriate nutrition education that makes a difference in their lives? This was the question staff with the UC CalFresh Nutrition Education Program in San Luis Obispo and Santa Barbara counties were asking ourselves as we prepared for a monthly presentation at the THRIVE Healthy School Pantry in Santa Maria, California. 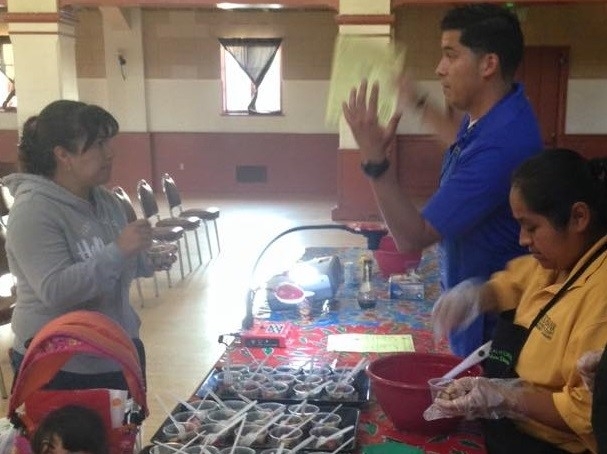 While many nutrition education programs work with local food banks to provide food demonstrations and nutrition information at supplemental food distribution sites, often, these classes can feel rushed. People are likely hurrying to pick up their food and so there is little time for more than just one-way communication where the educator provides the information and participants listen. Other times families may feel obligated to stay for the nutrition lesson in order to get their bag of food for their families. With our original classroom set-up there were not many parents participating. Those who were interested, would come up at the end to ask a question or give a suggestion. 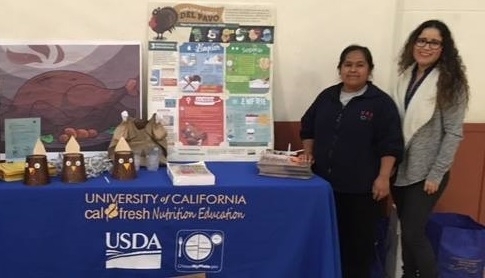 This was the experience of our UC CalFresh Nutrition Educators delivering presentations and recipe demonstrations at the Healthy School Pantry food distribution. The Healthy School Pantry is a monthly food distribution focused on increasing food security and providing a strong social network for families to access a wide variety of community resources in English and Spanish. When our nutrition education team started working at the Healthy School Pantry, the set-up was similar to a formal classroom environment where there was a teacher and students. The students (in this case, parents and families) would sit in rows, while the nutrition educator stood up front with a projector and microphone providing nutrition messages and a recipe demonstration using food from the pantry. 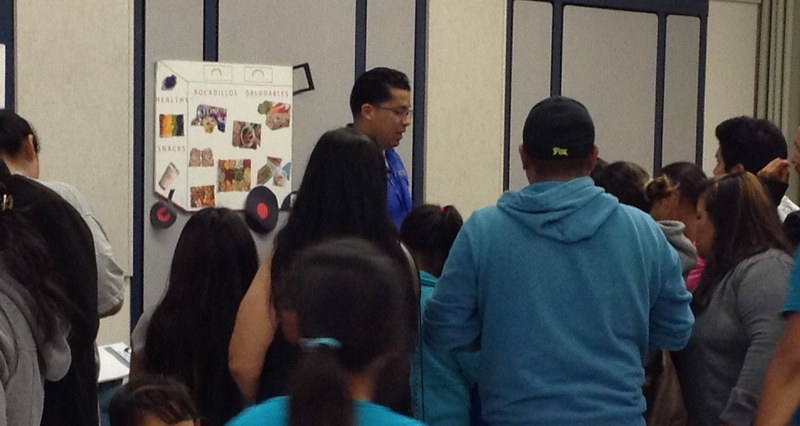 We would include skills for preparing a recipe, and offer food samples and practical tips related to USDA's MyPlate. After a few of these formal presentations, we began to notice that many parents were not interacting. We would ask for questions or suggestions on how participants could use this information or recipe, and most would respond with silence or politely, “todo está bien, gracias” [“everything is good, thanks”]. We also noticed other families would try to get past our table without making eye contact in order to leave. It became apparent that the families, for various personal or cultural reasons, did not feel comfortable participating and interacting in this formal class setting. Others just did not want to sit and listen for 15 to 30 minutes if they weren't sure that the information was going to be relevant to them. Setting up our table with a lot of visuals and standing in front to talk to parents. Taking this into account, we decided to modify our approach. First, we got rid of the microphone and projector and moved our table into a high traffic area more integrated with the other community resources. Next, we changed our presentations to be more participatory and conversational. We set up our table with a colorful display and often a food sample, and then we walked around to the front of the table where we could greet and approach the families without a barrier. At one recent event, we brought an activity wheel and some basic physical activity equipment like jump ropes and stretchy bands. Parents walked right up and started to spin the wheel. When it landed on an exercise they would grab the equipment and start doing the activity and asking for tips. We were so surprised that they wanted to actually do the exercise right then and there and were really interested in talking to us about how they could get more physical activity in their busy lives. At one point we had a long line of parents waiting. With these small changes, parents are provided more individual attention and an opportunity to have a conversation with the educator rather than feeling like they are students in a classroom. We are able to have more meaningful conversations and the parents are the ones approaching us and asking, “What recipe are you preparing today?” Parents are initiating the conversations and once we engage with them, they have many more questions about the ingredients, where to get them and the dialogue continues in a natural way that is meaningful and relevant to their lives. We are also able to clear up some misconceptions they may have. For example, we have heard many parents say they think that canned or frozen fruits are not healthy. Once we have their trust we are able to clear up the misinformation and let them know that canned and frozen produce can be an economical way to get more fruits and vegetables in their diet and, as long as there isn't added salt or sugar, can be just as healthy as fresh produce. The parents crowding around the table to see what we have and talk to an educator. Through these conversations, we see that families are leaving our table more informed and are more willing to seek out and approach our table the following month. The level and quality of interaction has increased and we are able to see and hear about the impact of our work and modify or change approaches based on the suggestions from the families. We will continue with this successful education delivery model because we have seen and heard the satisfaction of the families and have received a lot of great feedback from parents. These small successes that are revealed to us through mutually respectful conversations keep us motivated to continue to provide services and promote a healthier community in a way that respects and values the experiences and knowledge that our families share.